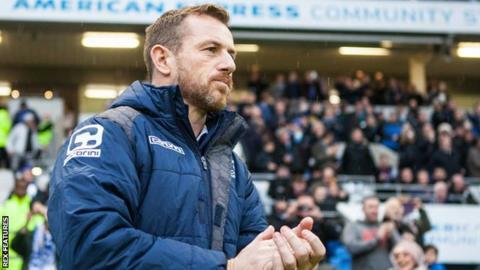 Birmingham City have confirmed that manager Gary Rowett is to stay at St Andrew's following speculation linking him with both QPR and Fulham. The 41-year-old, who was appointed in October 2014, admitted last week that he was "flattered" by interest in him. But a statement issued by Blues director Panos Pavlakis made clear that Rowett will not be leaving Blues. "Gary is fully committed to the club and likewise the club is fully committed to him," said Pavlakis. "We are all keen to put any uncertainty to bed and look forward to the continuation of the great work Gary has done since his appointment. "Fans can rest assured that everyone at the club is together as one striving for further improvement and success with Gary at the helm as manager. "The board will continue to fully support Gary in every way it can in trying to restore this great club of ours to a position where we all want to be." Rowett, who began his managerial career at Burton Albion, moved to Birmingham on a rolling contract following the departure of Lee Clark. After helping to save the club from relegation last season, he has guided them to sixth place in the Championship table this term. QPR and Fulham have both been looking for a new manager since early November after parting company with Chris Ramsey and Kit Symons respectively.